Great job! And amazing how you were able to maintain the highlights on all those tiny beads! Cool shoes and a great drawing. Looks like an ad in a lady's magazine! I still love the red themed drawings! I think it's somewhat becoming part of your signature now. Beautifully done this one! Liking the details so much. I am sorry my blog was confusing you a little. I am glad that's sorted out now. Thanks for your comments and support. 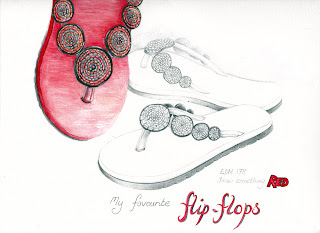 Pretty flip-flops. Love the colored and graphite contrasts. Thanks for the support and kind comments everyone. Alex, I think blogspot was having a bad moment, I went back later and had no problem. Love the flip flops and think the touch of red is a great addition. And as Alex said, it appears to be part of your signature. Glad you got the blip on Alex's blog to go away. Thanks for the follow-up email.